Marketing Collateral and much more! Being the 3rd party allows us to see both sides of the fence and approach potential leads while keeping our client’s best interests in mind. We know that when both sides are receiving benefits, then the connection is a true success. There is always a sense of ease when we approach someone as the 3rd party, rather than the direct person asking for money or a partnership. 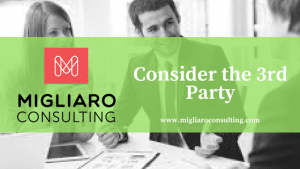 Our goal at Migliaro Consulting is always to thoroughly research our clients needs and interests, as well as the potential partner or sponsor. We dedicate that time on the back-end to help ensure a positive end result. If you are looking to learn more about having us serve as your 3rd party, give us a call today and we’d be happy to chat.